A Blanchester woman appearing on a bench warrant in the Hillsboro Municipal Court on Wednesday was also arraigned on a felony for alleged drug abuse. The Times-Gazette previously reported that Rebecca Ledford, 27, was placed on a $2,000 bond in October after she pled not guilty to first-degree misdemeanor possession of a controlled substance. 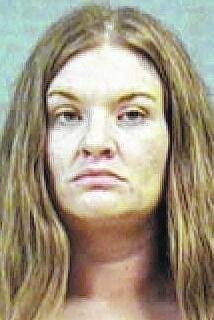 At that time, Ledford also had a pending case where she faced charges for possession of drug abuse instruments and possession of drug paraphernalia. All three charges were filed in February 2014, court records show. A warrant was issued for Ledford’s arrest last November after she failed to appear for pretrials. Ledford appeared on that warrant Wednesday and was also arraigned on fifth-degree felony drug abuse, according to records. It was later reportedly determined that a passenger – identified as Ledford – had a warrant out for her arrest. Also allegedly found during the search was $101 in cash and two cell phones. All items were reportedly confiscated. The officer reports that “due to the possibility of drugs being in areas that (he) couldn’t see,” he contacted the Mount Orab Police Department’s K-9 Unit, the affidavit states. The affidavit adds that the K-9 found another needle in a purse. Court records show that Ledford’s felony charge was first filed with the municipal court in January. On Wednesday, her felony case was scheduled for a preliminary hearing on June 25. Ledford’s bond was set at her own recognizance (OR). She will be under the supervision of the probation department and is prohibited from having contact with allegedly involved parties. Ledford’s bond was set at $25,000 on her pending first-degree misdemeanor for drug abuse. If she posts that bond, she will be placed on electronic monitoring house arrest. Pretrials for all three of her misdemeanor charges are also set for June 25. In other cases, Jacob Cox, 18, Greenfield, appeared on a bench warrant and was sentenced to 60 days in jail. Court records show that he pled guilty to attempting to purchase an illegal amount of pseudoephedrine, a second-degree misdemeanor, in February. At that time, all but 30 days of a 90-day jail sentence were suspended. A $750 fine was also suspended. Jacob Cox was placed on reporting probation for two years and ordered to have no contact Walgreens, to obtain counseling, and to get his GED. He was placed on a curfew until his counseling was complete, records show. In May, an affidavit was filed by the probation department, according to records. A warrant was then issued for Jacob Cox’s arrest for failure to comply. On Wednesday, Jacob Cox appeared on that warrant. He was found guilty of a probation violation and sentenced to 60 days in jail. That time is scheduled for July 3, records show. The Times-Gazette reported last week that Jacob Cox was arrested and charged with a felony following the discovery of meth-making materials at his Greenfield address. A warrant for another person at the residence is what led to the discovery. Also found guilty of a probation violation was Cora Cox, 33, Hillsboro. Records show that she was convicted of second-degree misdemeanor possession of drug abuse instruments in April. The Times-Gazette previously reported that Cora Cox was given credit for 32 days in jail. An additional 58 days were suspended. She was ordered to get counseling at FRS and to complete a safety plan through children services. Her license was suspended for two years. Cox was placed on a curfew until conditions are met. She was also placed on reporting probation. Last month, an affidavit was filed by the probation department, records show. A $5,000 bench warrant was then issued for Cora Cox’s arrest for failure to comply. She appeared on that warrant on Wednesday and was found guilty of a probation violation. The remaining 58 days on her sentence began when she was arrested on Tuesday.